One of the things that I most look forward to each summer is fresh local corn. Kate and I have really taken advantage of the corn season this year and have been gorging ourselves on grilled corn on the cob and corn pudding, both of which warrant future posts. 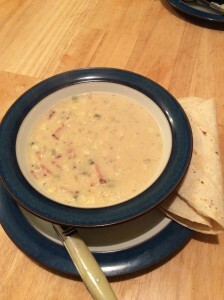 When it cooled off a bit earlier this week, though, what I really wanted was a big bowl of corn chowder. With that in mind, I walked down to the farmer’s market to pick up several ears of corn and was flummoxed to find that none of the stands had any. I remedied that with a quick side trip to one of the great nearby Mexican grocery stores where I found some lovely corn and was inspired to pick up some jalapenos, as well. On the walk home, I came up with this recipe. One of the key ingredients that give this chowder a rich corny flavor is corn stock made from the corncobs left over after cutting off the kernels. We already had a couple of quarts of corn stock in the refrigerator that we had made a few days earlier from corncobs we’d been collecting in the freezer from the corn we’d eaten so far this summer. If you’re not already doing this, I strongly recommend throwing your leftover corncobs into a Ziploc bag and collecting them in your freezer until you have a dozen or so. When you’ve reached critical mass, put the corncobs into a stockpot or Dutch oven, cover them with water, add a few teaspoons of salt and bring the pot just to a boil. Reduce the heat and simmer for 30 or 40 minutes until the stock tastes nice and corny. In addition to corn chowder, corn stock is a great thing to have a few quarts of in your freezer as a summery alternative vegetable stock. If you don’t already have corn stock made up, though, you can do a quick small batch just for this recipe as you’re prepping the other ingredients. I hope you enjoy this recipe as much as Kate and I did. It makes about four servings, but it took some willpower not to eat the whole batch the first night. We had warm corn tortillas to dunk in ours, but I’m sure that corn muffins or some crusty sourdough bread would be equally delightful. Nothing fancy in a way of a beverage is required, but you certainly wouldn’t go wrong with a couple of glasses of a nice cold Sauvignon Blanc. Shuck the corn, removing the silk as well as you can, and cut the kernels off of the cobs into a bowl with a knife (you should end up with approximately 2 cups of kernels). If don’t already have corn stock made up, put the corncobs into a large pot, cover with a quart of water, add a teaspoon of salt and bring the pot to a low boil over medium‐high heat. Lower the heat to a simmer and cook for 30 to 40 minutes, tasting the stock occasionally, until it’s nice and corny. When it tastes about right, take the pot off the heat, leaving the corncobs in the pot until just before you’re ready to add the corn stock to the soup. You should end up with about three cups of stock. While the corn stock is simmering, roast the jalapeno. I usually just turn on one of the burners of my gas stove, hold the pepper with a pair of metal tongs and fire roast it in the gas flame until it’s blistered all over. If you don’t have a gas stove, or want to be safer than crazy old me, roast the pepper in a small skillet over medium heat, turning it with tongs every so often, until it’s blistered all over. Either way, let the pepper cool a bit then peel off the blistered skin which will come away easily. Split the pepper in half, scrape out the seeds and dice the flesh of the pepper. Put the chopped bacon in a large, deep pot over medium‐high heat. When the bacon has cooked through, but is still soft, and has rendered a good amount of fat, add the chopped onion and cook, stirring frequently, until it is soft, about five minutes. Add the diced jalapeno and cook another minute or so. If the rendered bacon fat has all been absorbed by the onion and pepper, add a tablespoon or two of butter so that you have a few tablespoons of rendered fat in the pot with the vegetables and bacon. Lower the heat to medium and stir in the flour. Cook, stirring constantly with wooden spoon for a minute or two until the mixture starts to turn golden and the flour no longer smells raw. Add the milk and the reserved corn stock to the pot a cup or two at a time and turn the burner back up to medium‐high heat. Stir the soup constantly for about five minutes until the flour is incorporated into the soup and it starts to thicken. Stir in the reserved corn kernels and bring the soup to a slow boil, then bring the heat back down to a simmer. Simmer the soup, stirring occasionally, for 10 or 15 minutes until the corn is tender and the soup has thickened. Adjust the seasoning with salt and freshly ground pepper and serve. If you have any of the soup left over, the soup will thicken and the flavors will intensify in the refrigerator. When you reheat it, add a bit more milk to adjust the thickness. It will be even better the next day. Ooh, corn stock — what a great idea! Shoot, and we just tossed three cobs today, too. It’s especially nice when you’ve grilled the corn. The hint of smoke in the finished stock is pretty heavenly. I LOVE corn chowder, and it’s been ages since I made it. Corn stock is one of those magical things I wish I had known about so many years before I did! I know! When I first heard about corn stock I smacked myself on the head for not thinking of it myself. It’s SO wonderful, especially in the middle of winter when you’re craving corn, you can make tortilla soup out of it.